Coenzyme Q10 is important for maintaining a healthy heart and energy release through the years. It is acknowledged that the amount of Coenzyme Q10 present in the body declines with age, so supplementing the diet may help in maintaining a healthy heart. Coenzyme Q10 is a vitamin-like substance whose actions resemble those of vitamin E. It is fat-soluble and is stored in the fatty tissues of the body, reducing the need to ingest large quantities. Since Coenzyme Q10 is oil soluble it is best absorbed when taken with oily or fatty foods, such as fish. It plays a critical role in the production of energy in every cell of the body. It supports healthy circulation and is a powerful antioxidant. The black pepper fruit extract used in this product is BioPerine, a patented standardised extract containing 95% piperine. 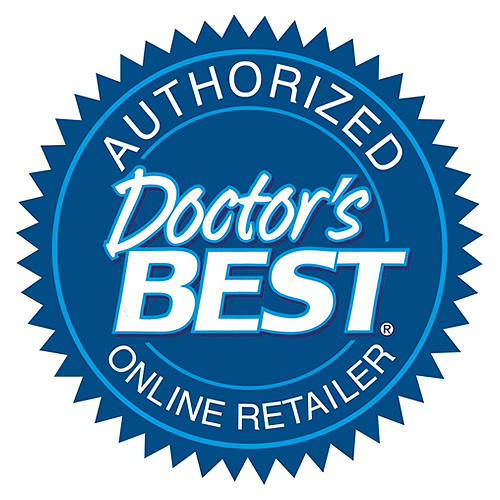 The black pepper fruit extract used in this product is BioPerine, a patented standardised extract containing 95% piperine from Saninsa Corp.
Below are reviews of High Absorption CoQ10 - Bioperine - 60 x 100mg Vegicaps by bodykind customers. If you have tried this product we'd love to hear what you think so please leave a review. 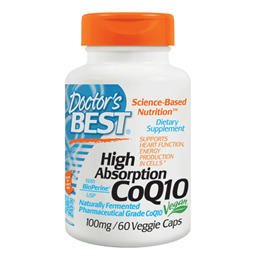 Doctors Best High Absorption CoQ10 with BioPerine contains fermented Japanese CoQ10 which helps support and maintain a healthy heart and promotes energy production in cells. Contains pure, vegetarian Coenzyme Q10 in a base of rice powder.